My service as a Peace Corps volunteer in Armenia has given me so much more than simply a new cultural perspective and some language skills. I am learning the meaning of patience, healing, gratitude and the significance of the traditions that bind families together. The Armenian family is the strongest and most important aspect of this ancient culture. 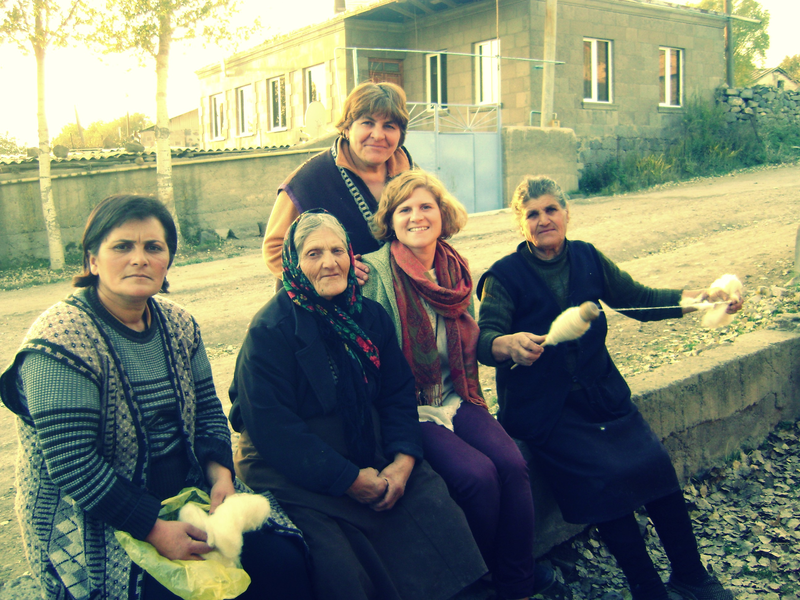 So what does that mean for a single American woman living alone in a traditional village in southern Armenia? First of all, the division between my personal and private life was quickly broken down. As a result, I have received the gifts of truth and compassion which were hidden just beneath the surface of the self I wished to show the world. One of the first and most common questions I am asked is “Do you have a mother and father?” My initial reaction was that this is a senseless question, because of course, biologically everyone must have a mother and father. So why do they ask? Because, there is something deeper embedded within the question particularly for me. In the community where I live, individuals are seen as members of a family, a clan which is a huge contrast to my experience being from the United States, where we have the freedom to reinvent ourselves over and over again with each generation. Here in Armenian, the people need to know, “Whose girl are you?” And since I am a foreigner living far from my family it is difficult to place me in this order of understanding. It is equivalent to asking “Who are you?” They need to know more about my family in order to understand who I am. But for me personally this is exactly the kind of question I have always feared and avoided. I have mastered my response with strategic tact using my developing language skills. I am able give a fairly elaborate answer these days, going off on a tangent about my father to redirect the focus of this seemingly absurd question. “I have a wonderful father. I love him very much. He is a very interesting man. He loves birds, fish and dogs. He worked as a driver. He drove a big cement truck and taxi in Chicago but now he is retired.” Yes, I am proud that I can say all of that in Armenian! Nevertheless, I cannot avoid having to explain to them that I do not have a mother. I quickly address their incessant inquires by telling them that she died in a car accident which is really only a sliver of the truth to explain her suffering and mine. As a result, the conversation gets a bit quieter and serious until someone may say something like “Ափսոս” (pity) and I quickly change the subject to something a bit lighter. Armenian mothers, especially in the villages, are conceivably the best mothers in the world because they start their training from a very young age. I have witnessed the preparation of motherhood beginning with a seven year old girl held responsible for cooing her infant brother. Women are wholly dedicated to their families with an ingrained sense of responsibility and often their primary purpose in life is to become a mother. They dote on their children and grandchildren and earn reverence for each new member of their family. I try to flatter the Tatik’s (Grandmother), by asking the number of grandchildren they have produced. Their lives are that of the reaper and sower. And like tending to their gardens they have amorous care for their families. I imagine that in their lives after marriage they have dutifully washed, dressed, fed, scolded, taught and loved their children and their children’s children. Finally, in their old age they rest on the stones along the street and take claim to a lifetime of work and dedication. One day while chatting with some of the local women, who were braiding garlic greens for winter, I was feeling particularly confident in my ability to communicate. After spontaneously constructing a new sentence in my mind, announced to them, “You know, I grew up without a mother but I moved to Hayastan and now I have many mothers.” Immediately after I finished speaking, I noticed tears swelled in the eyes of one of the grandmothers. I saw her response and desperately wanted to acknowledge it but found that I had no more words or clever sentences. I was speechless and touched. Finally as I eased into this place of discomfort, I realized that what I had said was the truth and it was part of my purpose in being here with these women. At that moment I knew, that by being here with them, they are helping me heal with their questions, sweetness, strength and generosity. Moments later I was gently escorted to the home of a neighbor who prepared and served me lunch as if I were her own daughter. The gift of our unavoidable suffering is that we share it and it connects us to every other person in this world. No one is untouched by life’s hardships. My suffering makes me human and exposing my vulnerabilities helps me receive, connect and heal. 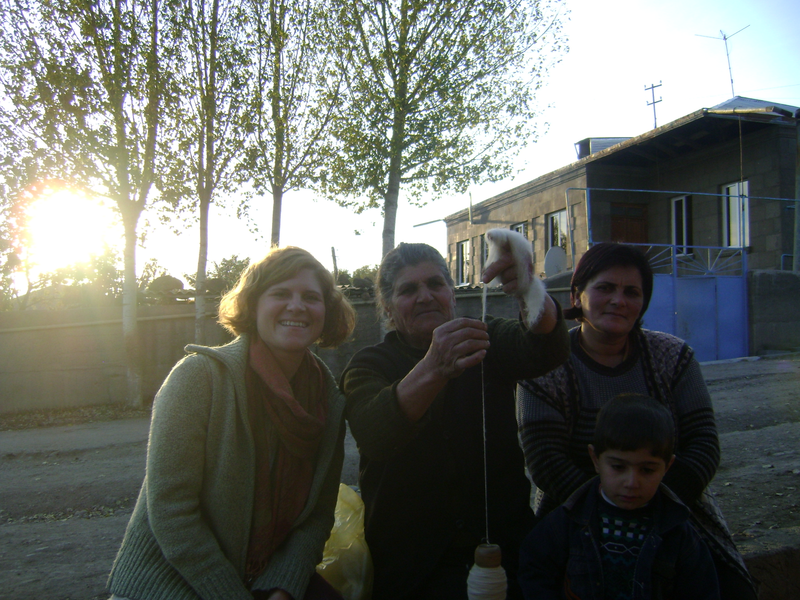 Andrea Grant is a Peace Corps volunteer serving in Angeghakot village, located in Syunik marz near Sisian. She has a two year contract to teach English with a local teacher at the village school. When she is not at the school, she practices yoga with villagers, sings songs with preschoolers and bakes homemade bread and cookies. This is a very touching story. Thank you for sharing. I’m looking forward to more entries.